Our focus is on . . .
A-Sharp DJ has the reputation of the DJ service that listens to you. We are fully aware that this is your day, not ours. 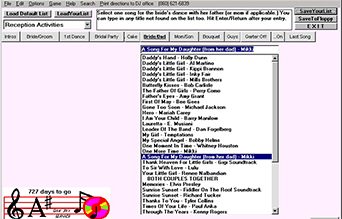 You have complete control over song choices and the activities at your reception. Are there certain group dances you hate, cross them off, they won't get played at all. But, should you want one of the latest line dances, you still choose whether we just play the song or use our wireless microphone and teach it from out on the dance floor. Not only do we encourage requests and dedications, but if you so desire, we can also pass out inflatable props, air guitars, etc. to motivate your guests. Seeing that the music can make or break a party, A-Sharp DJs are skilled at getting fully involved without drawing all the attention to ourselves. A-Sharp DJ is a family-owned, entertainment service; we maintain office hours all week long, prepared to research any questions or details you might have. We have custom designed and built our own remote-control CD-quality sound equipment, allowing your A-Sharp DJ the flexibility to start or stop songs from out on the dance floor. We set up early, arriving over half-an-hour before your party begins. 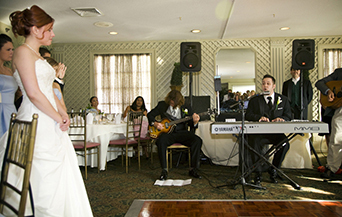 We are fully-insured and always bring backup equipment that doubles as an additional system for an on-site ceremony or a separate cocktail hour area. 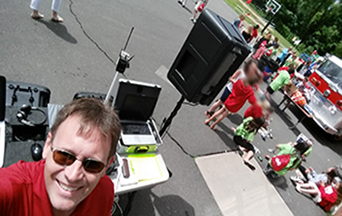 Digital CD-quality sound equipment like no one else. 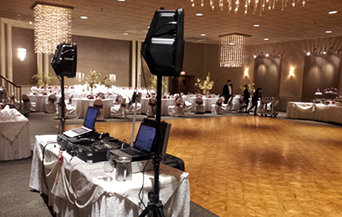 We have custom designed and built our own remote-control CD-quality sound equipment, allowing your A-Sharp DJ the flexibility to start or stop songs from out on the dance floor.